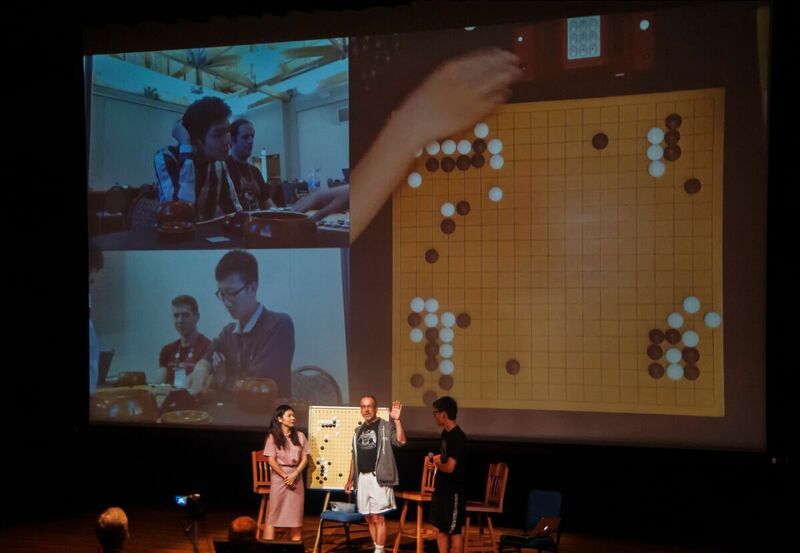 Tim Song 1P snatched the US Open Masters title from Ahn Dalhoon 9P, defeating the Korean professional in the ninth and final round by resignation in a thrilling game watched by hundreds on Twitch and KGS. 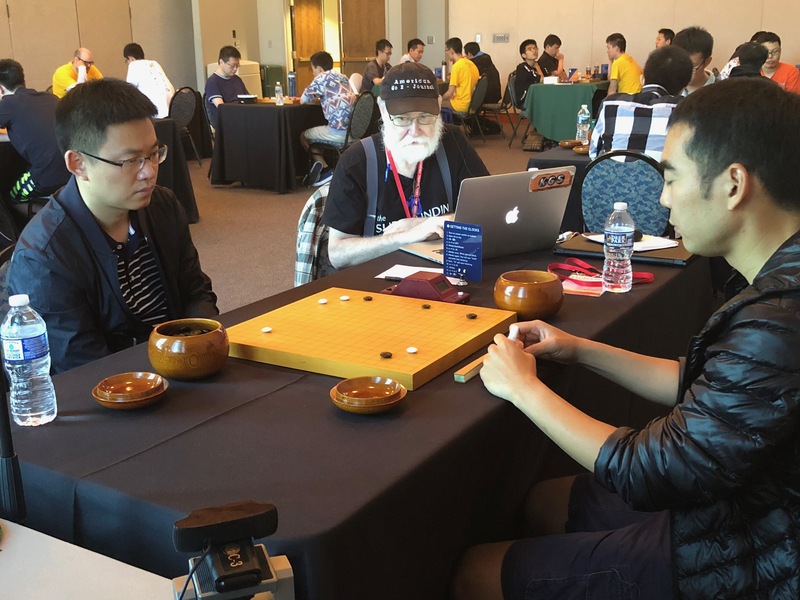 Tianyi Chen won the top section of the US Open (click here for the official final standings), and in an interesting wrinkle, 15-year-old Brandon Zhou 5d (right) went 6-0 to top the 5-dan division, defeating three 6-dans, including 6-dan division winner Tianyi Chen. 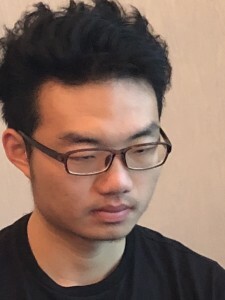 Commentator Yilun Yang 7P’s assessment in the Masters final was that Ahn had a good position until he ran into time trouble in the late middle game, but AI analysis indicated that Song had an advantage from fairly early in the game. 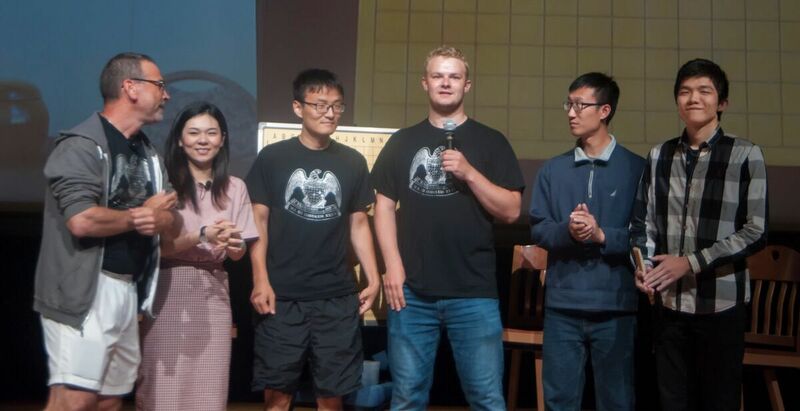 Either way, Song (left), a young Chinese pro who now lives in the US, relentlessly pressured Ahn until, with the last few seconds ticking away in his final byo yomi – and with two weak groups at stake, he turned off the clock in acknowledgement of his defeat. “I’m really impressed with way the field has developed in recent years,” said AGA president Andy Okun. 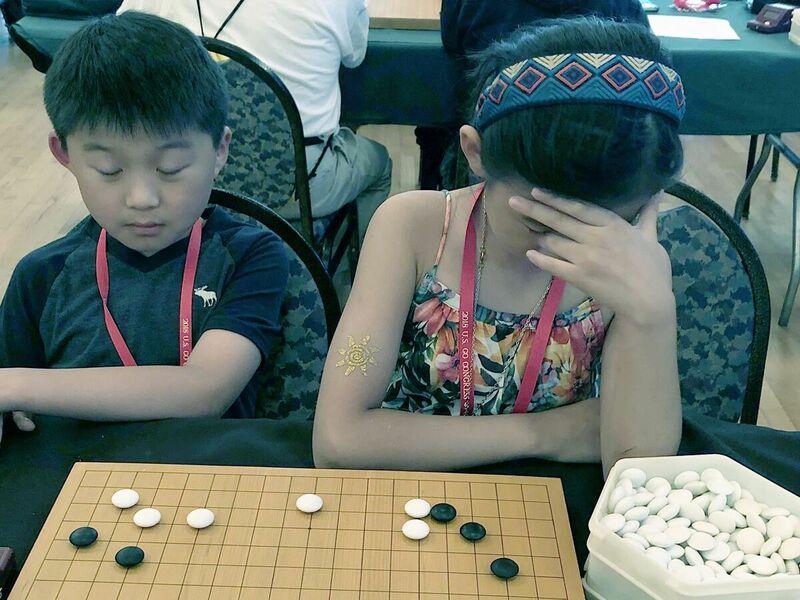 “It bodes very well for the future of American go.” The upset was not the only one of the day. 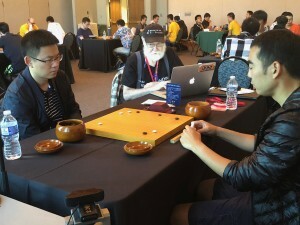 On board 2, Chinese pro Ding Wei 9P fell to Michael Chen 7d, also losing by resignation. The losses by the two top professionals threw the results into tiebreaks; both Ahn and Song were 7-2, but Song prevailed by a single SOS point. 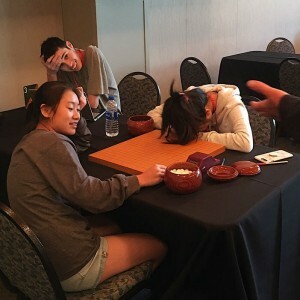 Song is the title winner, but because they had the same win/loss records, they’ll split the $7,500 first and second place prize money evenly. 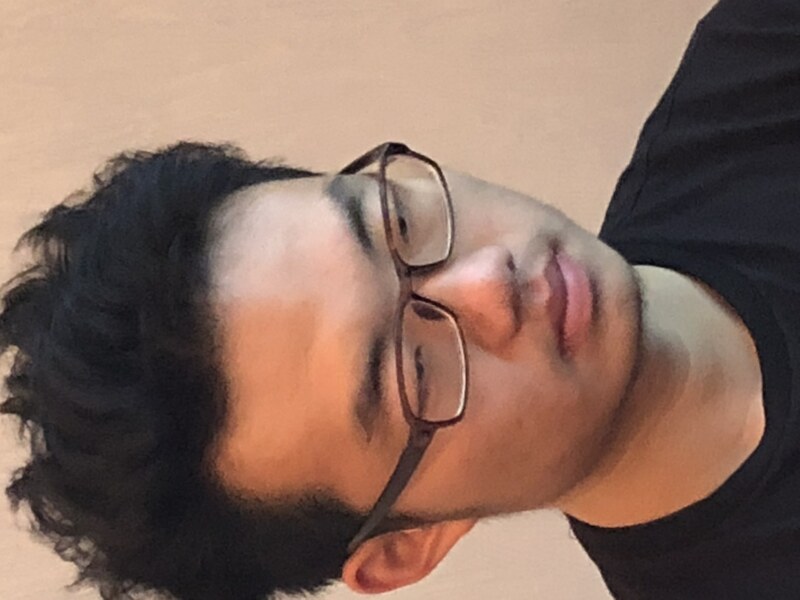 Four players had 6-3 records, and Ding Wei won the third place trophy on SOS; Andy Liu, Ryan Li and Michael Chen are the runners-up. Latest Masters crosstab here. 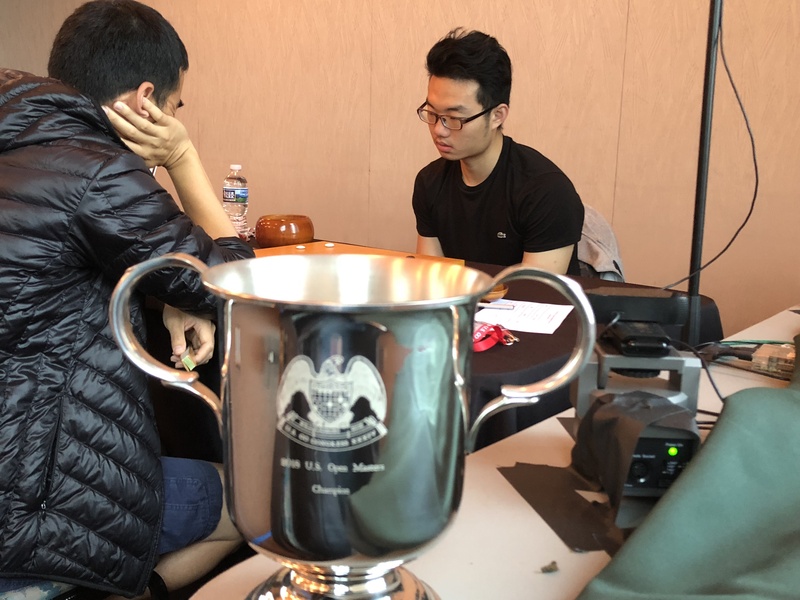 Dalhoon Ahn has a firm but not quite final grip on this year’s US Open Masters trophy, after winning both rounds on Friday and improving his record to 7-1. 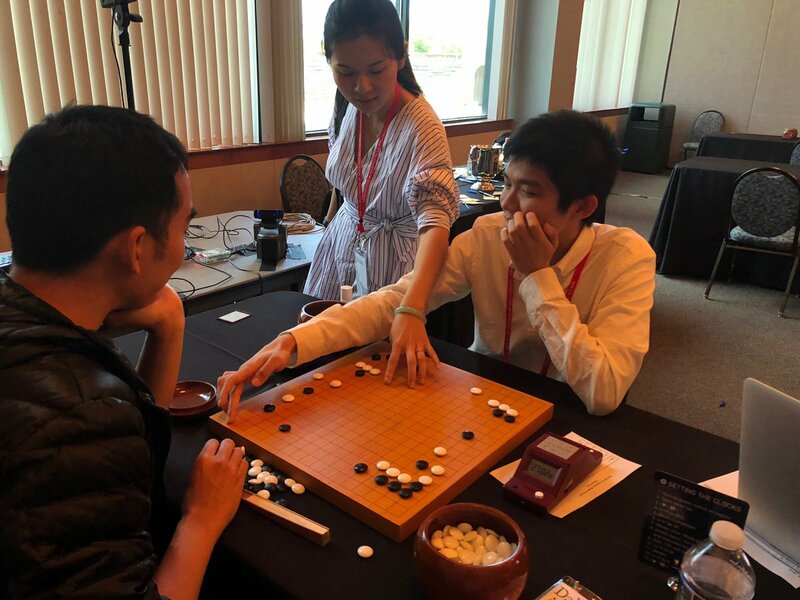 With two players with 6-2 records nipping at his heels — Wei Ding, Zirui Song — and one final round to go, the outcome is still to be determined Saturday morning in Round 9. 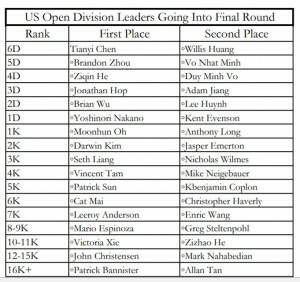 Check the latest results on the US Open Masters crosstab. 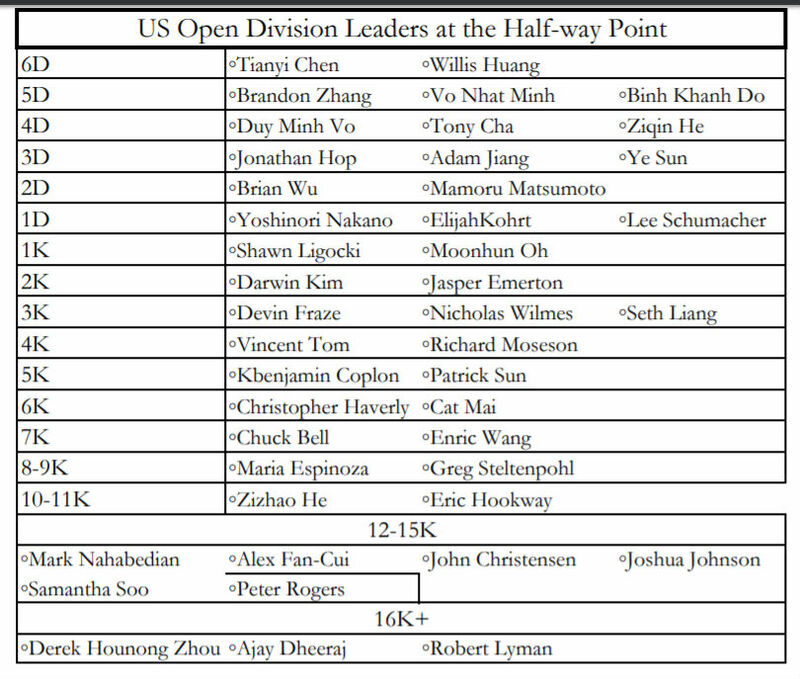 See the chart at right for the division leaders in the US Open, which also has one more round to go Saturday morning; click here for the US Open crosstab. 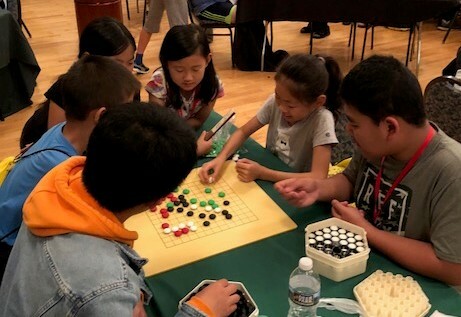 Watch top boards in the Masters live on KGS and Twitch (Friday night’s coverage attracted more than 12,000 viewers) starting at 9a EDT and check out this week’s videos on YouTube. 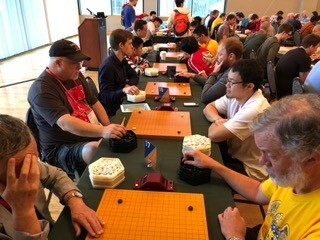 Thursday evening at the US Go Congress means that time for Pair Go. 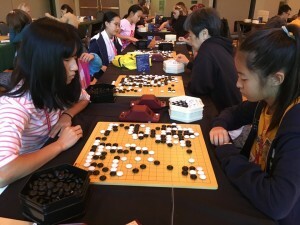 This year, 36 pairs gathered in the Sadler Center to compete in this popular tournament. 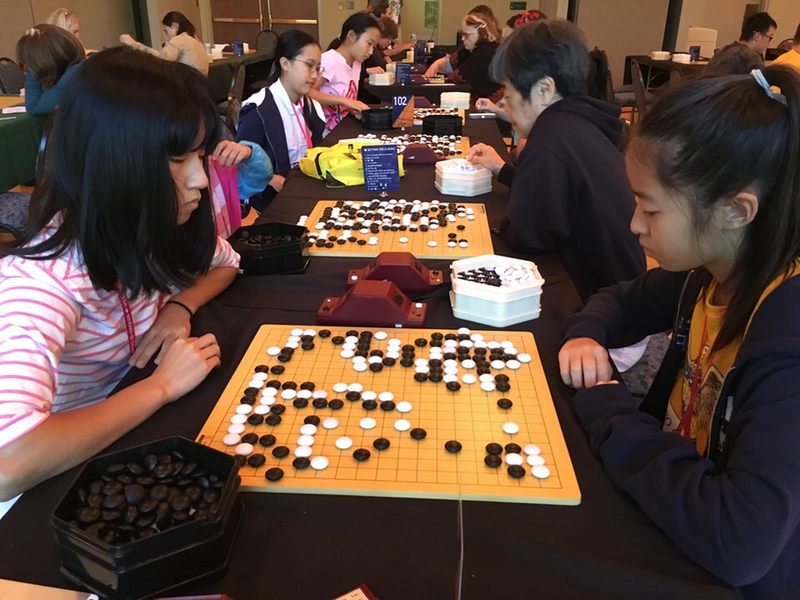 Sophia Wang 3d and Alan Huang 7d won the Open Section and will represent the United States in the 2018 International Amateur Pair Go Championship in Tokyo during the first weekend of December. Table Winners: Yoonyoung Kim 4p and Diego Pierrottet 4k; Seowoo Wang 2d and Nhat Minh Vo 5d; Cathy Liao 10k and Michael Chen 7d; Vivie Truong 5k and Bill Gundberg 2k; Yoko Ohashi 6k and Mark Fraser 6k; Bethany Nyborg 18k and Keith Arnold 4d; Vidie Pong 12k and John Uckele 4k; Tonya Perez-Lopez 20k and Tevis Tsai 6k. 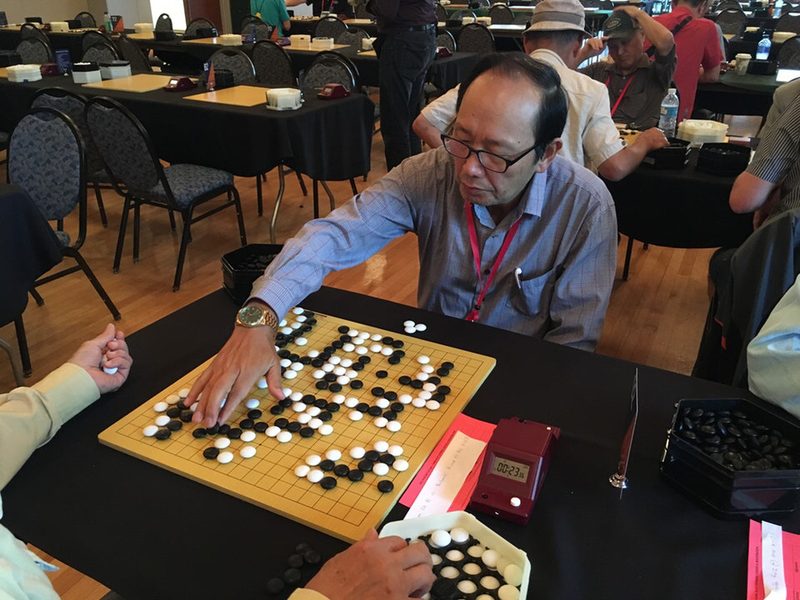 The Seniors Tournament featured tough competition in both the Dan and Kyu divisions. “Special shout out to Motoyoshi Makino for being able to defeat champion David Cho,” said TD Greg Kulevich. 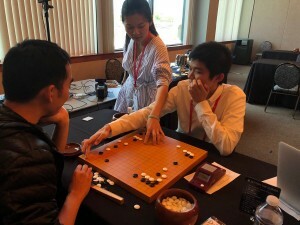 Makino defeated Cho in the final round, but Cho’s score on tiebreaks prevailed to make him the Dan champion. In the Kyu division, Moonhun Oh was the only undefeated in the end, making him champion of that division. Steffen Kurz won the sportsmanship prize. Shunichi Hyodo (4-1) was second in the Dan division and David Frankel (4-1) was third. Pete Schumer (4-1) took second in the Kyu division and Jim Pickett (4-1) was third. Rain helps boost Diehard turnout: This year’s Diehard Tournament — the traditional 4-round Day Off tournament — had 95 players, up from 90 last year. 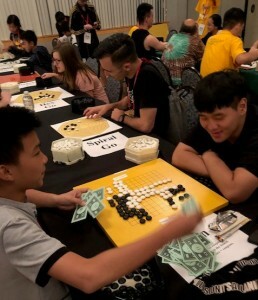 “The rain may have caused some people to revise their day off plans,” says TD Andy Olsen, “because many players registered at the last minute Wednesday morning.” The field attracted a good spread of players, from three 7 dans to many double-digit kyus. 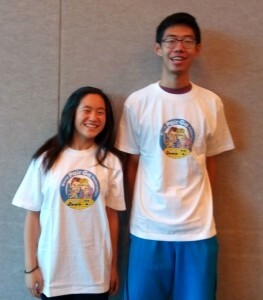 Top section Winners: 1st: Tianyi Chen 6d; 2nd: David Cho 5d; 3rd: Ary Cheng 5d. Additional prizes awarded to undefeated players: Eli Ferster 5k and Dave Whipp 7k. 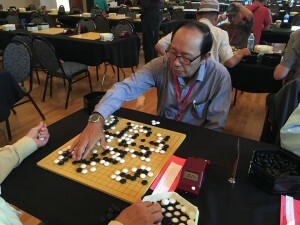 Aaron Ye clinches Redmond Cup Senior Division; Bao and Cheng tied in Junior; : Aaron Ye clinched the senior division Monday against Jeremy Chiu. 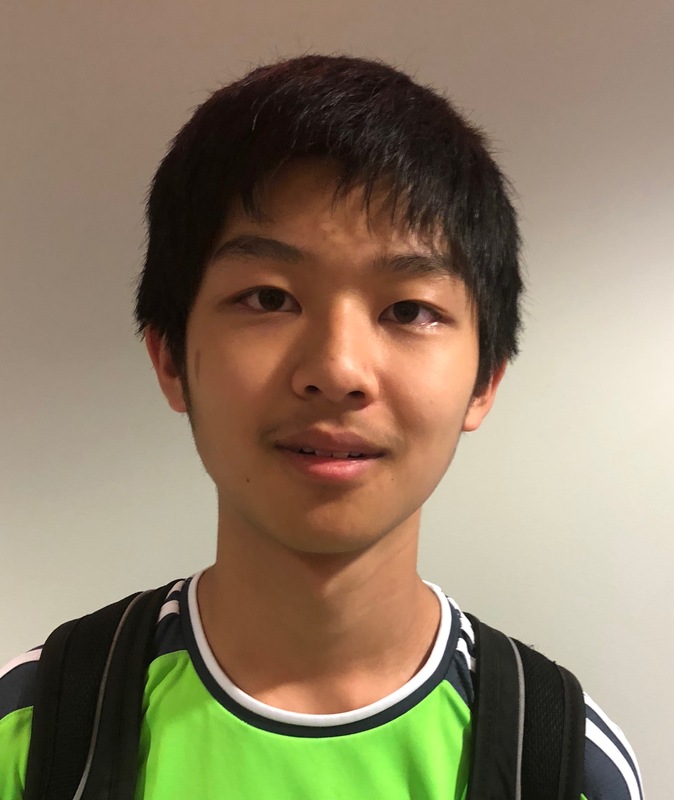 Frederick Bao bounced back against Ary Cheng in the junior division, making the series 1-1. 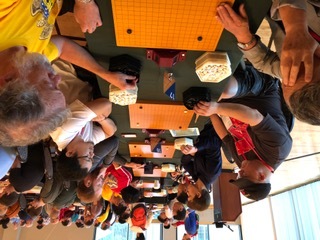 Sibicky and Nyborg tops in 9×9: Nick Sibicky 4d is the dan division winner in the 9×9 tournament and the kyu division winner is Bethany Nyborg 18k. 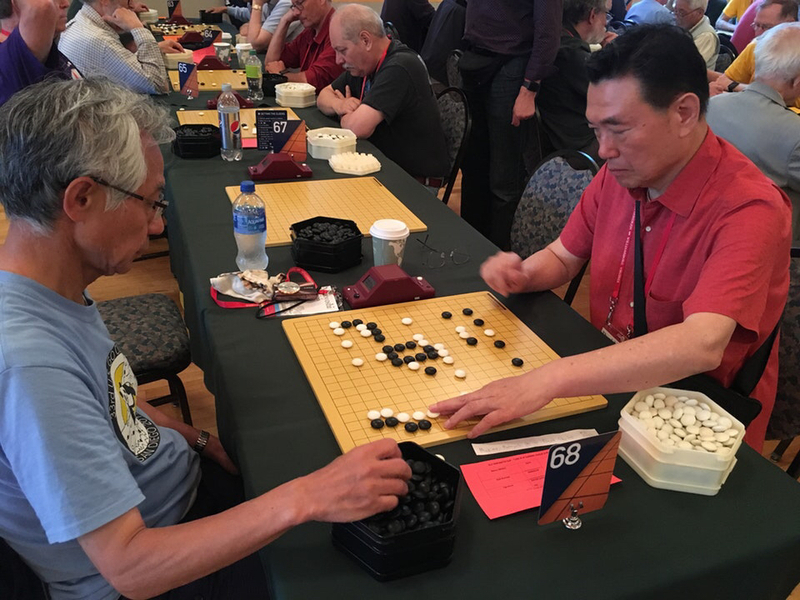 “Why We Play” returns: E-Journal reporter Samantha Fede has been posting new “Why We Play” profiles in the Go Congress app social feed, like this one for Greg Steltenpohl 8k (left), who’s from Madison, WI and has been playing for two years. 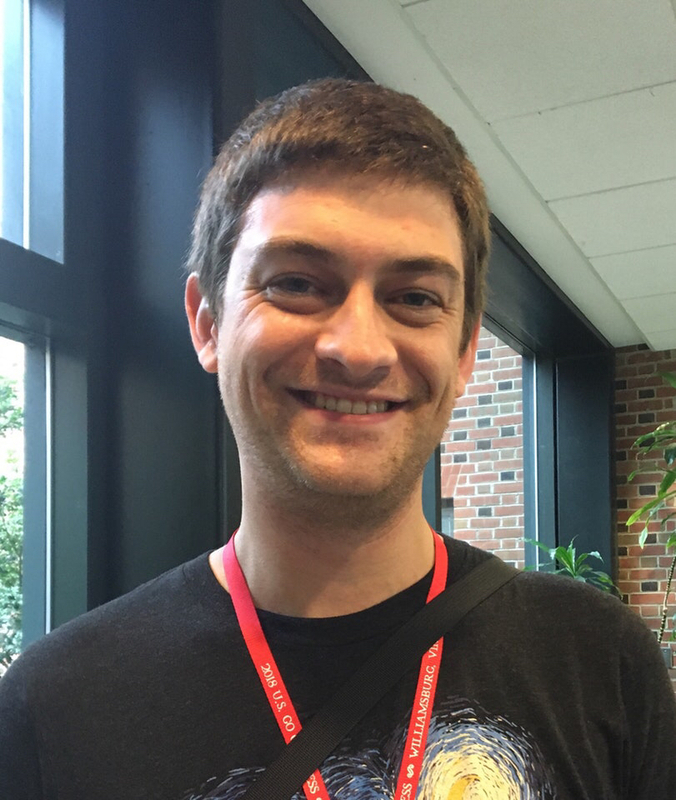 Greg’s favorite thing about go: “It’s kind of like programming in that you build a mental game/problem space and you get to navigate through that. I like doing that in programming and go. Solving a big puzzle. 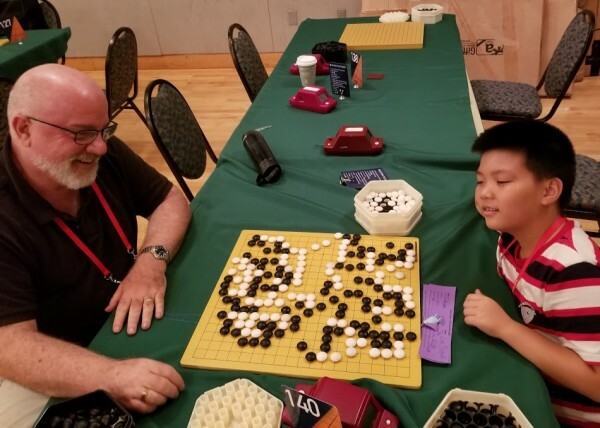 I also like to play games of go on my phone anytime I have a little time.” This is his first go congress, and he has already volunteered for next year’s Go Congress in Madison. photos by Phil Straus; top: (l-r) Yin, Garlock and Gong commenting; bottom (l-r): Garlock, Yin, Gong, Pinkerton, Liu, Li. With the US Open at the halfway mark, here’s a quick snapshot of the leaders in each band. 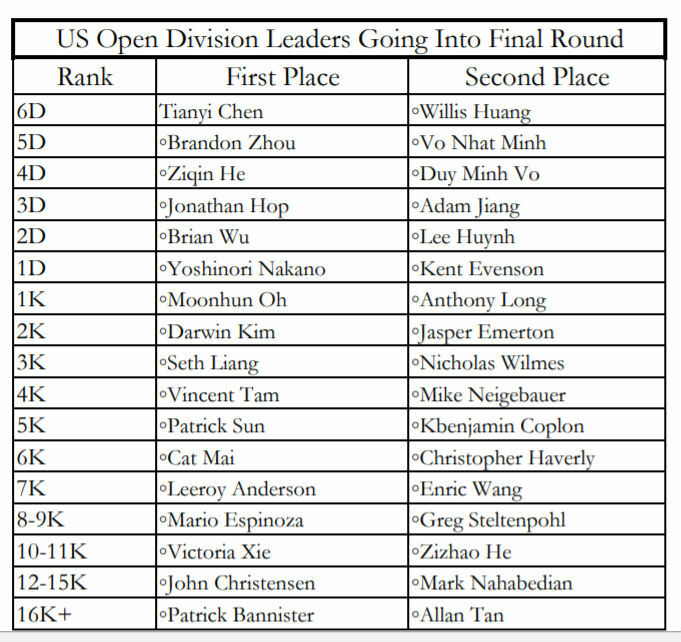 They’re almost all undefeated, though in the 6D section only Tianyi Chen is undefeated and in the 2D section, only Brian Wu is undefeated. 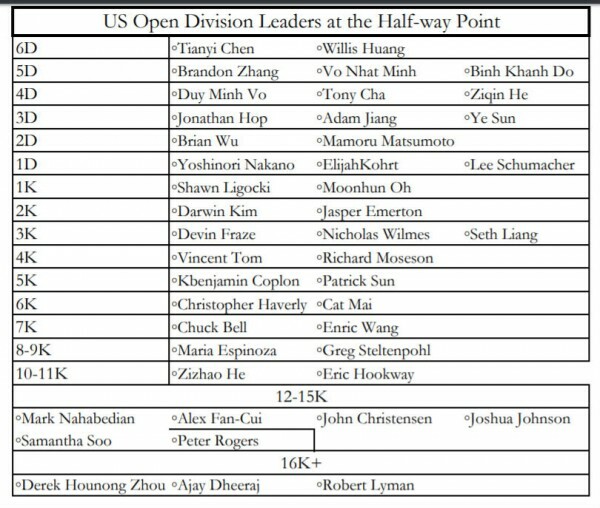 Click here for the US Open crosstab. If you’d like to preserve your Open game records for posterity, send them to journal@usgo.org and we’ll add to the crosstab (be sure to complete all the game info, including result).